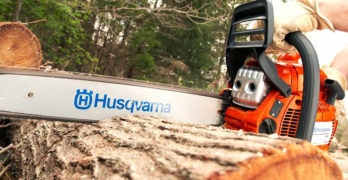 What do you think are the top 5 chainsaws on the market today? If you ask ten people you’ll get ten different answers. We understand that everyone has their strong views on what makes a chainsaw great. It’s a subjective topic and there is no right or wrong answer. Ultimately the best chainsaw for you might be different than what your neighbor needs but if you’re a beginner when it comes to the world of chainsaws we think you’ll find this article beneficial. Homeowners are always looking for new tools and power equipment for their home. Let’s be honest, there’s always something that needs to be done around the home. 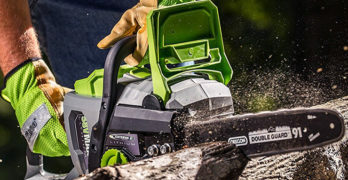 Pruning trees, limbing and cutting firewood go hand-in-hand with owning a home, which is why we decided to put together this article focused on the top 5 chainsaws for homeowners. Chainsaws seem to be flying off the shelves these days. Homeowners are finally realizing life is easier when you have one in the garage. You’re obviously interested in them at the moment, but do you have any idea where to get started? There are so many different options available to you. We’ll look at the top 5 chainsaws on the market, but first we’ll discuss the advantages of each kind. Let’s start by quickly brushing over some things a chainsaw will let you do. What Can you do with A Chainsaw? Landscaping – If you wanted your garden to look more attractive you might decide to trim your trees, which would take all day if you used a saw. Once you have a chainsaw you’ll be able to cut through branches of all sizes in no time. Cutting Logs – Anyone who has a log fire might decide to cut their own firewood instead of buying it. You’ll save a huge amount of money over the years. You will also save yourself a great deal of energy if you don’t chop anything manually. Storm Cleanup – The country has been hit by a few devastating storms over the last year. When trees fall down inside your garden they’ll need to be chopped up before you can carry them away. Using a chainsaw to clean up damage makes this problem somewhat effortless. Please Note: There are light-duty chainsaws all the way up to heavy-duty models. The best chainsaw for you will depend entirely on your individual needs. You’ll Never Run Out Of Electricity – You can run out of gasoline and your battery will die, but you’ll never run out of electricity. The only time you won’t be able to use an electric chainsaw is when you’re suffering from a power outage. Usually The Lightest Of The Bunch – It’s a lot more comfortable using a chainsaw when it’s light. You’ll feel less fatigued after you’ve finished cutting branches too. Electric models are usually the lightest because they don’t have a battery. They Won’t Cost You A Lot Of Money – Battery-powered chainsaws contain cutting-edge technology. Gas models are usually big and powerful. It means they’re not always cheap, but you’ll find great deals when looking at electric models. They’ll Give You A Lot More Control – Battery-powered chainsaws are nearly as light as electric ones, plus they don’t have an annoying cable attached. It means you’ll have a lot more control when you’re cutting with them. You Won’t End Up With Damaged Ears – The decibel level of gas-powered chainsaws is far too high. Cordless models are normally much quieter when you’re cutting, plus you can hardly hear them when the chain isn’t making contact with anything. It’s Easy To Get Them Up And Running – If you want to start a cordless chainsaw you need to press a button. It’s a lot easier than yanking the cord you’ll find on gas models. No emissions means you can start them up inside in winter too. They’re Usually A Lot More Powerful – If all other things are equal gas chainsaws will always be more powerful. They’ll also have longer bars if you need a big one. This is important if you’re going to be carrying out heavy-duty tasks. Can Always Be Used In An Emergency – You can’t use electric chainsaws when there is no power. A cordless model will only work until the battery dies. If you have spare gasoline in your garage you’ll always be able to use a gas model. You Can Carry Them Around Anywhere – If you have spare gasoline you’ll be able to carry a gas chainsaw anywhere with you. This could come in handy if you have a large garden. Battery-powered models will eventually need to be recharged. Please Note: Sometimes different kinds of chainsaws can share the same benefits. You’ll see it a lot with electric and cordless models. Keep this in mind when you’re choosing your favorite one. For the average homeowner, this is the perfect chainsaw. WORX power tools are designed to handle the toughest tasks. Not only should customers be able to complete them quickly, but each job should be easy too. They’ve been working hard to achieve this for nearly one and a half decades. They are one of the most innovative companies in the industry and strive to improve with each passing year. They don’t have the same rich history as a few competitors, but looking at the tools it’s easy to see they’re catching up. The best overall value chainsaw has to be able to handle any tasks you throw at it. There is no need to worry about the WORX WG304.1 letting you down, because it comes with a 4.0 horsepower 15 amp motor. There is more than enough power to cut through anything. The fact it’s got an 18 inch bar makes it even better. This is long enough to cut through thick branches, but it’s still short enough to use at home. When your chain is loose it’s impossible to cut anything. Accidentally tighten it too much and it won’t last very long before it breaks. The WORX WG304.1 chain will be okay thanks to the patented auto-tension system. You won’t have to do anything manually once the chainsaw is up and running. The system includes an oversized knob that secures the bar and chain. You’ll be able to use this to change the chain without using any tools. You’ll find a rubber over-molded rear handle and full-wrap front handle on the WORX WG304.1 electric chainsaw. They’ve been engineered to keep your hands comfortable while giving you total control at the same time. You can grip onto them easily even when you’re wearing gloves, plus it won’t be difficult to keep the trigger compressed. When your hands are in position the chainsaw will feel well-balanced. The WG304.1 comes with a low kickback bar, so it’s unlikely to give you many problems when you’re operating it. There is a chain brake safety feature built into it just in case something goes wrong. If the bar ends up kicking back in your face the chain will stop instantly thanks to the brake. If you look at the bottom of the bar you’ll see an extra safety feature. Spikes will keep it stable while you’re cutting. You don’t have to worry about gasoline when you own an electric chainsaw, but you do have to keep the chain oiled. If it’s dry when you’re cutting through branches it won’t last long and your life will be difficult. The WORX WG304.1 will be able to lubricate itself automatically, so you won’t have to remember to oil it all the time. You’ll only have to keep the reservoir filled up and there is an indicator to help you. One of the biggest benefits of electric chainsaws is how light they are. This model only weighs 11.3 pounds, so you’ll hardly notice it’s in your hands. It means you’ll be able to carry it around all day without getting tired. The overall size of the WORX WG304.1 is 8.1 x 14.6 x 20.6 inches. Even though it has a long bar it’s small enough to be stored away in your garage when it’s not in use. The size and weight will suit nearly every homeowner. BLACK+DECKER is one of the top brands in the world, so it’s obvious they would make an appearance on the top 5 chainsaws list. They’ve been innovating in the industry for over a hundred years and have achieved some amazing feats along the way. If you look at all their milestones you’ll notice one simple thing. They’ve strived their hardest to meet customer needs, which have changed from decade to decade. Once you’ve used the BLACK+DECKER LCS1020 you will know they’ve succeeded again. It’s hard to imagine a battery-powered chainsaw lasting a long time, but the 30V Max battery inside the BLACK+DECKER LCS1020 is great. You’ll get around 150 cuts on a single charge if the branches are 1-1/2 inches thick. Unless you have large trees in your garden it’s unlikely there will be lots thicker than that. Even if there is you can keep going all day. Just make sure you always have a spare battery charging up. You know how many cuts you’ll get if you’re cutting thin branches, but what about if you’re cutting thicker ones? If large branches fall down in a storm you want the power to chop them up. You’ll have a 10 inch cut capacity, which is respectable enough for a light-duty chainsaw. If you have massive trees in your garden it’s likely you’ll turn your attention towards one of the other top 5 chainsaws. You don’t want to leave your battery on the charger non-stop until you eventually need to cut something. Luckily the 30V Max battery is so good it will keep its charge for an entire year. The fade free performance is around 5 times better than other batteries. If you only need your chainsaw to tidy up a few trees and bushes you won’t need to keep a backup battery on hand. Your cuts will be extremely smooth because the BLACK+DECKER LCS1020 has an Oregon bar and chain. You’ll want to ensure it lasts as long as possible, which will be easy thanks to the auto oiling system. Keep the reservoir topped up and it will be oiled automatically, plus you have the option of using the primer button. If you keep your eye on the window you’ll see when you need to top up the oil. Once you start cutting it might feel like it’s not efficient enough, which doesn’t necessarily mean your chain isn’t sharp. If you change the tension of the chain a little it could solve your problem. The BLACK+DECKER LCS1020 won’t do it for you automatically, but it’s still possible to do without tools. You can make simple adjustments quickly until you find a tension you’re happy with. The biggest reason why this battery-powered chainsaw only weighs 7.2 pounds is because it has a 10 inch bar, but it’s still tremendously lightweight. You’ll be able to swing it around until it runs out of juice. Thanks to its weight you’ll get a few extra benefits when you’re working. Arm fatigue will disappear and you won’t get injured. You’ll also have total control even if you’re not particularly strong. An very well made electric chainsaw. Makita is another company that started over a hundred years ago, so it’s no surprise it’s made it onto the top 5 chainsaws list. Every person on worksites around the country will know their name, but they manufacture amazing power tools for regular homeowners too. You’ll find them in 40 countries around the world at the moment. They even have 10 large plants in 8 separate countries to keep up with demand. They’re driven by advanced research and development to come up with power tools you won’t find anywhere else. Electric models aren’t always very powerful, but this model is an exception thanks to the unique engineering by Makita. The Makita UC4051A chain will spin around the bar at 2,900 feet per minute at max speed. It’s fast enough to cut through any branches in its path. You’ll be able to tackle much bigger jobs too, because the bar length on this model is 16 inches. It’s more than enough for any average garden. When a chainsaw is so powerful there is a chance it will burn out. This can happen when the saw is overloaded and in most cases, there is nothing you can do about it, but the Makita UC4051A is different. It has a current limiter built into it, so it will reduce power automatically when it fears there is any chance of burnout. This feature is one of the reasons why the UC4051A will last longer than similar models. The UC4051A has another great feature that will extend the life of your motor. This one is noticeable when you switch the chainsaw on. When you squeeze the trigger it will start up smoothly. A soft starter device will temporarily lower the torque and load inside the motor during startup. It reduces mechanical and electrodynamic stress, which should increase the lifespan of the system. When you pick up the Makita UC4051A you’ll notice it’s extremely comfortable straight away. The rubberized grip handles are a pleasure to hold, plus they’re never going to slip out of your hands. There is a guard in front of the forward handle, so you won’t cut yourself on flying wood chips. It’s also been designed to give you total control over the large trigger when you’re cutting through branches. There is a metal spike bar at the base of the chainsaw to give you more control when you’re cutting. Due to the fact it will stop the Makita UC4051A from moving around so much you’ll be more productive. The electric chain brake built into the tool helps with productivity too. You’ll be able to stop the chain from turning once you’ve cut something. It means you won’t have to wait for it to slow down before moving on. The Makita UC4051A is great when it comes to productivity. It will oil the chain automatically while you’re cutting, so you won’t need to keep stopping if you have lots of work to do. A view window on the large oil reservoir will let you see what level the oil is sitting at. If you feel like the chain isn’t at the correct tension you’ll be able to adjust it without using any tools. No fumes and powerful enough to handle large trees. The best battery-powered model in the top 5 chainsaws list is the first tie we’ve seen today. 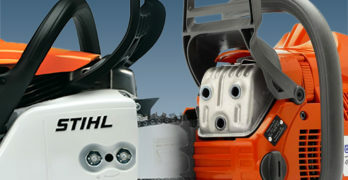 The crown is split evenly between two completely different companies, but they both offer fantastic cordless chainsaws. GreenWorks are leading the way when it comes to eco-friendly power tools. In the next few years they hope to be one of the biggest players in the industry. DEWALT officially formed in 1924, so it has nearly a hundred years of history on its side. It’s also one of those brand names nearly everyone knows about because they’re so popular. Matches the power of a 45cc gas chainsaw. Quiet, clean and versatile. The GreenWorks Pro GCS80420 80V battery will last a very long time. If you switched the chainsaw on it would run for approximately 60 minutes. When it’s cutting branches a single change will handle around 150 of them. When it’s combined with the DigiPro brushless motor you’ll be able to tackle countless tasks. These motors are known to be the equivalent of 45cc gas engines. You’ll need a bit of extra power when wielding an 18 inch chainsaw. If you buy an average cordless chainsaw the battery could take hours to charge up. The one inside the GreenWorks Pro GCS80420 will be fully charged in around 30 minutes, which is almost impossible to beat. You have a couple of choices you can make. If you do need to cut more than 150 branches you can have a break while your battery is charging. If you own a couple of them you’ll never have to wait around again. If you’ve used lots of gas-powered chainsaws in the past you’ll know how difficult they are to start. You need to keep pulling a cord for ages while hoping your chainsaw finally kicks into action. It’s the exact opposite when you own a GreenWorks Pro GCS80420 chainsaw. You’ll be able to start it up by pressing a button. This is even more useful in winter when it’s cold outside and your hands are freezing. One of the beautiful things about battery-powered chainsaws is the vibrations you’ll feel when they’re in your hands. The GCS80420 vibrates about 70 percent less than your average gas-powered model. The chainsaw only weighs 10.8 pounds and your body will never feel fatigued. Cordless models are much safer on your ears too. Even at full power they’re a lot quieter than gas chainsaws, and when you’re not cutting they hardly make a sound. All homeowners who decide to start using a chainsaw want to see safety features, so you’ll be pleased to know the GCS80420 has a few. It has an electric chain brake to stop it from turning when it’s not in use. The durable metal wrap around handle will keep your hand away from the chain, plus it will help stop debris from hitting you. Steel bucking spikes will give you more control when you’re cutting through anything. If you decide you like GreenWorks power tools it’s unlikely the GCS80420 chainsaw will be the last one you ever buy. Unfortunately, if you want to build a collection of them it will cost a lot of money. The GreenWorks 80V battery system will make things a bit cheaper for you. The battery will work in any of the tools. You’ll have a lawn mover, hedge trimmer, leaf blower, and other wonderful tools to choose from. Powered by Dewalt’s flexible 60V Flexvolt system. Professional-grade. 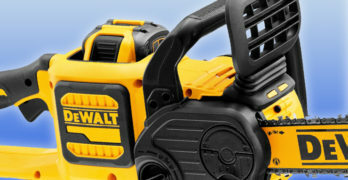 If the battery in your DEWALT DCCS670X1 is fully charged you’ll get around 70 cuts per charge. This might seem low compared to other models we’ve looked at, but this model wasn’t tested against thin branches. It was tested against pressure treated pine wood measuring 6 x 6 inches. The battery lasts an extremely long time, so if you’re only cutting 1-1/2 inch tree branches you won’t run out of juice for a while. When you’re working at home 16 inches is a good enough bar length to deal with any tasks. You’ll be able to cut most tree trucks in one fell swoop, which should only be attempted if you can do it safely. It comes with an Oregon bar and chain, which is the best in the business. They can be found on the top chainsaws in the world. When DEWALT offer anything it’s always built to last for many years. The FLEXVOLT 60V Max battery will hold its charge for a very long time, so you won’t have to worry about leaving it lying around in your garage. You’ll only run into a problem if you forget to charge it up. How will you know if there is enough power left to complete a certain task? You’ll only have to glance at the LED state of charge display. It will tell you whether or not you have enough juice in seconds. This chainsaw comes equipped with a low kickback Oregon bar and chain, so it’s unlikely to bounce back in your face. Unfortunately, chainsaws are dangerous so you don’t want to take any chances. It’s why the chain brake on the DEWALT DCCS670X1 is absolutely essential. It will stop the chain as soon as it runs into any difficulties and launches towards you. You’ll feel more confident cutting once you realize this. If you want to cut through wood like butter you’ll need proper bar clamping force. In order for this to happen your chain will need to be at the correct tension, which you can adjust on this model without any tools. You’ll have the power to play around with the tightness of your bar too. Due to the fact you’ll be able to do these things by turning a knob it will only take you a few seconds to ensure the correct tightness for optimal performance. It’s great when a chainsaw has the ability to lubricate itself automatically, but this will only work for so long. Eventually you’ll need to fill your reservoir up with oil or you will damage the tool. When you want to pour oil into the DEWALT DCCS670X1 it will only take a second. It has a quarter-turn cap that is easy to open and close. Once it’s full you can return to cutting without any difficulties. X-Torq Engine: Designed to reduce emissions while providing lower fuel consumption. Watch video. The final one we’re going to look at in the top 5 chainsaws list is a heavy-duty model. Husqvarna reigns supreme in this category thanks to their 455 Rancher. 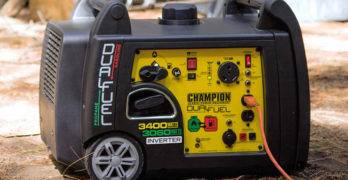 The company are one of the global leaders when it comes to outdoor power products. They’re so popular their annual sales sit at around 5 billion dollars per year. Over 13,000 people are employed in 40 countries around the world. It’s not surprising their power tools can compete with any you can throw at them. The 55.5cc 2-stroke engine inside the Husqvarna 455 Rancher packs quite a punch. It’s unlikely you’ll come across any tasks you won’t be able to handle, even if a tree falls down in the middle of a storm. It’s not just because of the amazing power you’ll have at your fingertips. The 455 Rancher also comes with an extremely long 20-inch bar. It’s the longest one we’ve looked at today by a couple of inches. Everyone always complains about gas-powered chainsaws damaging the environment, which is fair enough because they do. At least the Husqvarna 455 Rancher tries to be more eco-friendly by using X-Torq technology. It will reduce fuel consumption by up to 20 percent, plus it will lower dangerous emissions by as much as 60 percent. It’s easy to see why it’s been deemed CARB compliant allowing it to be sold in California. Earlier on we talked about gas-powered chainsaws being difficult to start. It’s true you can’t get them up and running by pressing a button, but the Smart Start technology inside the 455 Rancher does help. It has an air purge that removes air from the carburetor and fuel system. The choke/stop control helps with starting too, plus it’s also going to reduce the risk of your engine ever flooding. Maintenance work is almost non-existent when you’re dealing with corded and cordless chainsaws, but gas-powered models need to be looked after. The centrifugal air cleaning system makes things easier. It will remove any large dust and debris particles long before they reach the filter. The air filter will need to be cleaned out less often. The technology will also increase the lifespan of your engine. The LowVib system has been engineered to reduce the amount of vibrations you feel. It’s a pretty big feature when you take into account its power. The front handle has been designed to help with fatigue too. It sits at a 7 degree angle allowing you to hold onto it much easier. The chainsaw bar is 20 inches long, but it still only weighs 12.8 pounds. A noise level of 104 decibels means you’ll only be comfortable if you wear ear protection. When you spend money on heavy-duty chainsaws you expect them to last for a lot of years. I don’t think the Husqvarna 455 Rancher will let you down. The three-piece crankshaft is forged to give you maximum durability. An adjustable oil pump will let you choose how much is released based on the conditions. Other features like the air injection and LowVib technology combine together to add years to your chainsaw. If you want more information, read our indepth review of the Husqvarna 455 Rancher. Before deciding which chainsaw to buy you’ll need to sit down and ask yourself why you want one. Will you be carrying out light-duty tasks, or will you need something more powerful? 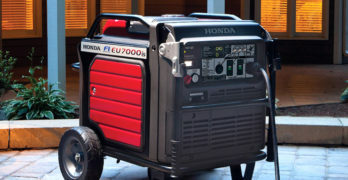 Weigh up the pros and cons of electric, cordless, and gas models too. Hopefully one of the models on the top 5 chainsaws list will take care of all your needs. If you require a little extra help read some unbiased reviews on Amazon. They’ve been left by past customers and they’ll help you come to a final decision quickly.